Clients can avail from us a plethora of Electronic Extensometers. These extensometers are manufactured using quality tested raw material in accordance with international quality standards and guidelines. 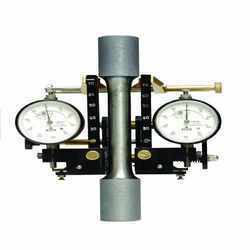 All the extensometers offered by us are widely used for testing stress & Young modulus valuesof wide range of metallic material. Further, proof stress methods are used to get yield values of brittle materials such as high carbon steels, alloy steels, light aluminium and magnesium alloys. 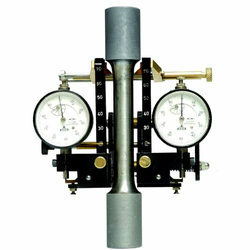 We bring forth to our clients, a premium range of Electronic Extensometer. Manufactured using superior quality raw material and high-tech machinery, these extensometers are designed in accordance with international quality standards. To meet the variegated demands of our clients, we offer these electronic extensometers in different sizes, gauze lengths and computerized UTM. Moreover, our diligent quality auditors make sure that only flawless products are delivered at customers' location within the committed time-period. 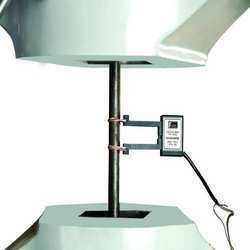 We are one of the accredited manufacturers, suppliers and exporters of Mechanical Extensometers. These extensometers are manufactured using optimum quality raw material employing latest tools and techniques. All the products offered by us are widely applauded in the market for its various excellent features such as sturdy construction, high durability and high mechanical strength. Our clients can avail these products from us in varied sizes and other specifications by paying through varied simple paying modes as per their ease. Looking for Mechanical Extensometers ?